Christmas makes us think of friends. And in Visuality friends make us think of our garden, where in warmer months we use to invite them for merry gatherings. Alas, it was winter, and our garden stood cold and desolate. So the IoT club decided to light up the atmosphere and invite people to the garden anyway - virtually. 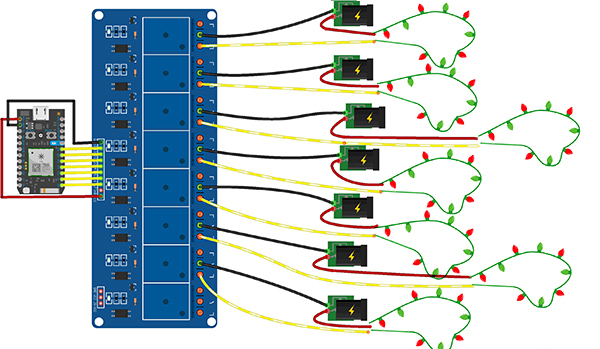 We came up with an idea for crowd controlled garden lights, which anyone could blink remotely through a simple webapp. First we installed 7 different lights in the garden. Some were fancy garden illuminations, some were regular Christmas tree lamps - the more the merrier. To control them we plugged them to a relay module connected to Particle Photon. As for Particle Photon, it's a small but powerful microcontroller. It comes already Wi-fi enabled and with a set of cloud management tools. It can be programmed remotely, so it was very convenient during development, especially when the device itself was installed in the basement cell and was difficult to physically access to each time we wanted to make a change in the program. To handle each animated sequence of the lights we used sets of 32 bit commands. The first four bits of each command are its type, the interpretation of the rest depend on the type. We handle three types of animation. To display each animation frame we decoded it on Photon, set the pin states accordingly and kept up this state for the set duration. Next thing we wanted to have is a video stream that would enable people from outside the office to see the lights. 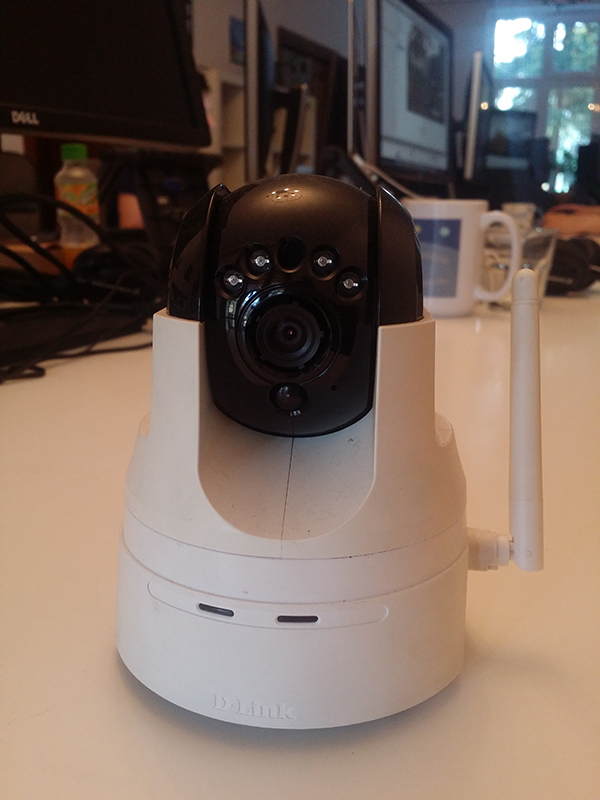 We used D-Link DCS-5222L IP camera installed in our garage to record a view of the house. 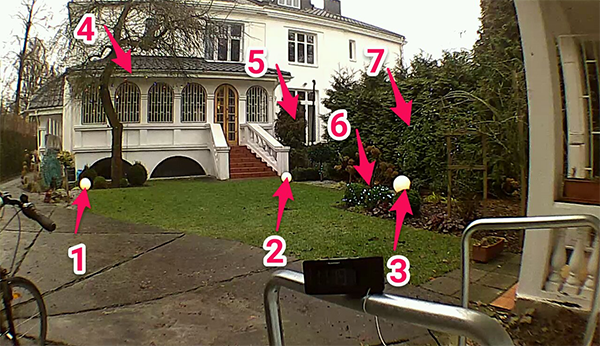 The camera can be accessed from a local network through its public .sdp file, which defines the parameters of the video streaming. 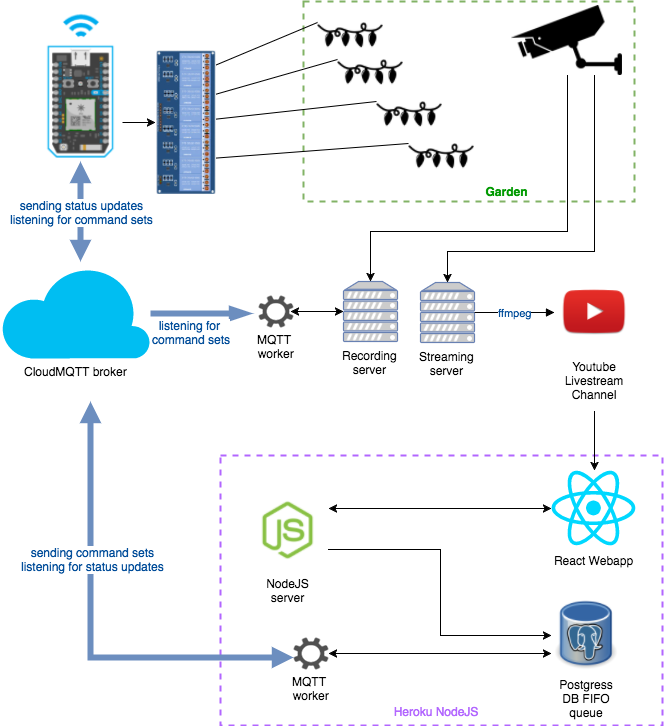 To record a video from this stream to the file we used ffmpeg. Sadly we couldn’t get rid of the ~15s delay on the stream. In normal live streams such a delay is negligible, but in our case that meant that the guest who left his wishes would have to wait for them to appear. This delay comes from youtube processing the stream and could be avoided in lower quality transmissions. The design of our page however required HD, for the full screen view. Finally we needed a way to give the control over the lights to the people. 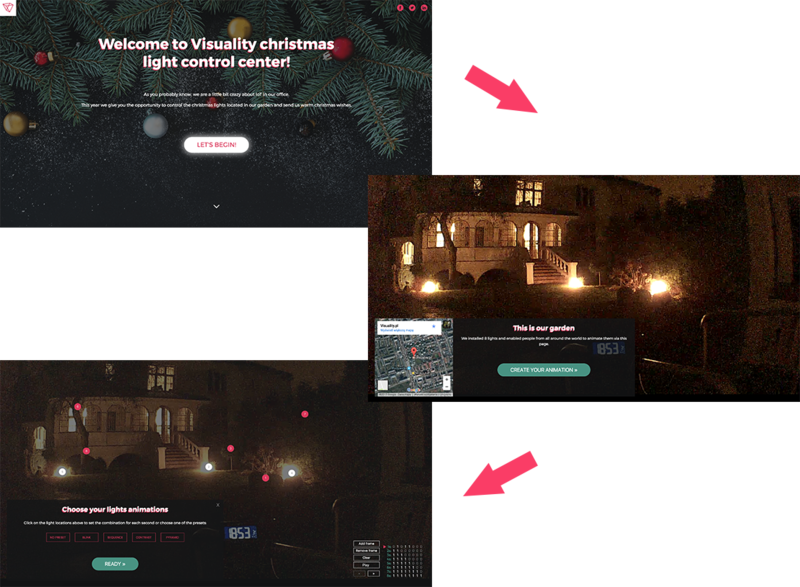 We created a React.js application which displayed the livestream and enabled the visitor to click on the positions of the lights to design their own animation, send them to our garden and watch as they are executed. For this we created a frame editor component, which converted the user-selected light states to a command set which we stored in a database along with the authors signature and their Christmas wishes. With the three sections covered, the missing link was something to enable communication between all the parts. And the answer was MQTT. MQTT (MQ Telemetry Transport) is a lightweight messaging protocol. It provides the publish/subscribe queuing pattern through the use of an MQTT broker. It is designed so that it would ensure reliable asynchronous communication even in unstable and low-bandwidth networks, which makes it perfectly suited for M2M (machine-to-machine) communication. All the wishes created by the user landed in the Postgres database on Heroku. Each wish record had a created_at, send_at and played_at fields. Each second the worker was polling for the unsent wishes, sending them to the CloudMQTT client and then updating their send_at field. The last piece of the puzzle was recording a video from each animation to have an archive of all the wishes. We configured another node web worker connected to CloudMQTT and had it running on a separate recording server. It was subscribed to the state updates started and stopped. On animation start it ran an ffmpeg command and on animation stop it killed the process. -pix_fmt + -c:v copy -c:a aac -strict experimental -f flv "
We managed to get this project online by December 20th and sent it out to our family and friends. During cold winter evenings each blinking of the lights visible from our windows made our hearts warm up.